Lake-Rattlesnake, People-Mashers and Water-Baby Spirits! 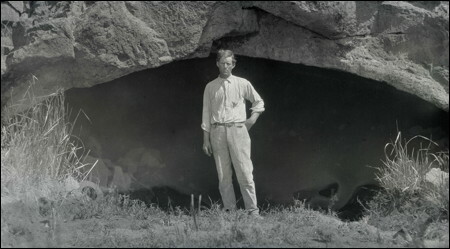 On July 1, 1913, wildlife photographer and writer William L. Finley visited Malheur Cave in southeast Oregon. Also called by its nickname, Creepy Cave, the Masonic Lodge of Burns has held annual gatherings deep inside the cave since 1938. Conspiracy theorists claim the cave has been host to satanic rituals and devil worship for most of the last century, and that the cave is part of a vast network of tunnels that connect Freemason caves all over the country. They also claim that Indians believe that the cave is an entrance to the underworld. Details are sketchy and elusive. Long before that, the Northern Paiutes called it Water Cave. From 1891 until his death in 1913 (the same year Finley visited the cave), Dr. W. L. Marsden practiced medicine in and around Burns. He became interested in the Paiute language of the area, collected stories and texts, and shared his work with professors A. L. Kroeber and T. T. Waterman at the Department of Anthropology at UC Berkeley. This included a story about Malheur Cave, told by Patotzi ("Foam"), of the Wadatika band of Northern Paiutes. He was born at Muddy Dance Place (Diamond Valley) and was well-known as a storyteller. "Coyote, you must not go in there!!" Gray Wolf said, "Here on earth you will freeze to death; and you must not eat." Now Coyote's soul doesn't go anywhere in this country. It is in that place. It is said that Coyote's soul cannot die; this soul was created here as a very strong conjured-being. Coyote did some bad things and can't go to the spirit land. In olden times the Lake-Rattlesnake had a hole. In the hole lived giant People-Mashers and Water-Baby Spirits. All of these things lived in Malheur Cave. The Great Man created snakes, the Lake-Rattlesnakes, the buffalo, and the Water-Baby Spirits. Water Cave (Malheur Cave) used to be called the Water-Baby Spirits' country according to our forefathers. Many saw them in there, and that is no lie. The Water-Baby Spirits built with rocks and piled them up somewhere in there. Inside the earth there are these different people according to the traditions. They have many horses and many deer. The Creator of Men taught this to his children after our people were created. "They appear to be like people, but those beings are different. They are not any children. They have no mouths and they used to eat through their nostrils. That's the kind they are." I've come across one of the People-Masher cannibals in other Paiute stories. He is called Noomoozoho, sometimes translated as People-Pounder, because he travels the countryside with a giant mortar and pestle, nabs unsuspecting folks, pounds them in his stone bowl and gobbles them down. In some of the stories, Noomoozoho gets killed by Coyote, and the Paiutes are quick to point out, "See? Sometimes Coyote does some good in the world." 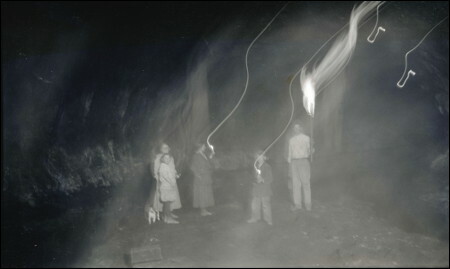 The first photo shows William Finley standing at the cave entrance in 1913, and the second photo shows William and Irene Finley, William Finley, Jr., Phoebe Katherine Finley, an unidentified woman, and Pete the dog inside the cave.